The Denver Museum of Nature & Science is a municipal natural history and science museum in Denver, Colorado. It is a resource for informal science education in the Rocky Mountain region. A variety of exhibitions, programs, and activities help museum visitors learn about the natural history of Colorado, Earth, and the universe. The 716,000-square-foot (66,519 m2) building houses more than one million objects in its collections including natural history and anthropological materials, as well as archival and library resources. The museum is an independent, nonprofit institution with approximately 350 full-time and part-time staff, more than 1,800 volunteers, and a 25-member Board of Trustees. It is accredited by the American Alliance of Museums (AAM) and is a Smithsonian Institution Affiliate. The museum provides programming in six main areas. The exhibitions, IMAX films, lectures, classes, and programs pertain to one or more of the following core competencies: anthropology, geology, health science, paleontology, space science, and zoology. More than 300,000 students and teachers visit the museum with school groups each year. In addition, the museum has science outreach programs and distance–learning opportunities for families, schools and surrounding communities. The museum also offers ongoing professional training workshops for teachers. 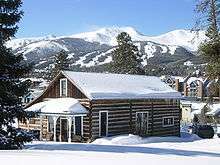 In 1868, Edwin Carter moved into a tiny cabin in Breckenridge, Colorado, to pursue his passion, the scientific study of the birds and mammals of the Rocky Mountains. Almost single handedly, Carter assembled one of the most complete collections of Colorado fauna then in existence. Word of Carter's collection spread and, in 1892, a group of prominent Denver citizens declared their interest in moving his collection to the capital city for all to see. Carter offered to sell the entire collection for $10,000. The founders also secured a collection of butterflies and moths, and a collection of crystallized gold. Together, these three collections formed the nucleus of what would become the Colorado Museum of Natural History, officially incorporated on December 6, 1900. After years of preparation and construction, the Colorado Museum of Natural History finally opened to the public on July 1, 1908. John Campion, the first president of the board, said in his dedication address, “A museum of natural history is never finished". The first director was hired and quickly recruited staff to build more exhibits and create public programs. By 1918, another wing had opened and research efforts were well underway. In 1927, a team led by the Denver Museum discovered two stone projectile points embedded in an extinct species of bison, in Folsom, New Mexico. These Folsom points demonstrated that humans had lived in North America more than 10,000 years ago, hundreds of years earlier than previously believed. The museum is partially funded by the Scientific and Cultural Facilities District (SCFD), which was created by area voters in 1988. It has also attracted large donations from benefactors, such as Morgridge Family Foundation led by philanthropist Carrie Morgridge, which gave $8 million to the museum in 2010, described as being the largest single gift since its founding. Barack Obama speaks with CEO of Namaste Solar Electric, Inc., Blake Jones, while looking at solar panels at the Denver Museum of Nature and Science, Feb. 17, 2009. Discovery Zone is a hands-on educational center geared toward children, allowing them to dig up dinosaurs, make craft, and inspect insects. Expedition Health teaches visitors about the human body, including the science of taste. Gems & Minerals is a re-created mine where visitors can examine many colorful crystals and minerals found both locally and globally. North American Indian Cultures explores the diversity among Native American groups and the practicality and artistry of their everyday objects. Prehistoric Journey traces the evolution of life on Earth. Displays include skeletons of diplodocus, allosaurus, and stegosaurus, a sea lilie reef diorama from 435 million years ago, a cast/replica skull of the ancient placoderm fish, dunkleosteus, and a collection of trilobites. Space Odyssey is about the Universe and our place in it. Wildlife Exhibits are animal dioramas showing scenes of daily life of many different animals. The Anthropology Collection contains over 50,000 objects and is made up of archaeological and ethnological artifacts from North America. The department also curates collections from Central and South America, Africa, Asia, and Oceania. Additional holdings include the 800-piece Ethnological Art Collection, and archival photographs and documents. The department is fully committed to compliance with the 1990 Native American Graves Protection and Repatriation Act (NAGPRA) and all other national and international laws that impact anthropological objects. Earth Sciences Collection consists of six main groups: vertebrate paleontology, paleobotany, invertebrate paleontology, minerals, meteorites, and micromount. Health Sciences Collection is composed of rare and unique human anatomy specimens, as well as a small selection of pieces of medical importance. Space Sciences Lab is responsible for the museum's Scientific Instruments Collection. This collection is composed of instruments that have been used by museum staff members or are excellent type-examples of particular instruments. In addition, the Department of Space Sciences maintains a large digital collection of images and multimedia assets (presentations, video, visualizations) of use in research, public programs, and Space Odyssey. Zoology Collection houses over 900,000 specimens or specimen lots (groups of specimens) including over 40,000 vials of arachnids (spiders and their relatives), over 780,000 insects, especially the orders Coleoptera (the beetles) and Lepidoptera (the butterflies and moths), 17,000 shell lots representing shells from all over the world, approximately 52,000 bird specimens, including a significant nest and egg collection, over 14,000 specimens of mammals, including several threatened or endangered species and several species now considered extinct. The small botany collection includes over 2,500 specimens representing 130 families. Specimens records are published, via Arctos and Symbiota, to data portals such as SCAN, ORNIS, MANIS, VertNet, GBIF, GenBank, and BISON. Bailey Library and Archives focuses on anthropology, earth sciences, health sciences, space sciences, zoology, the Rocky Mountain West, and museum studies. It contains over 53,000 publications, 2,500 rare books, and 9,000 volumes of scientific periodicals. Ancient Denver, a series of paintings by local artists that depict the Denver area from 300 million years ago to the present. Maya: Hidden Worlds Revealed, a large exhibit covering art, culture, astronomy, religion, ball games and warfare, as well as potential reasons for the collapse of the Mayan empire. Whales: Giants of the Deep, an exhibit that originated in New Zealand, where there was a large whale-fishing industry. The exhibit includes whale skulls and skeletons, videos, cultural artifacts, and "explaration stations". Traveling the Silk Road, artifacts from the ancient trade route, from Xi’an, the imperial city of China’s Tang Dynasty, to Istanbul. Gates Planetarium is a 125-seat planetarium that features unidirectional, semi-reclining stadium seating, 16.4 surround-sound system featuring Ambisonic, a 3-D spatial sound system, and a perforated metal dome, 56 ft (17 m) in diameter and tilted 25 degrees. The current planetarium replaces an older, dome-style planetarium. The Phipps IMAX Theater on the second floor of the museum was built as the Phipps Auditorium in 1940, and was used for lectures, concerts, and films until 1980. Renovated and reopened in 1983 as the Phipps IMAX Theater, it seats 440 people and now shows large-format IMAX films daily. In 2014, a $70 million addition was added to the museum containing the Morgridge Family Exploration Center and the Avenir Collections Center. The Morgridge Family Exploration Center constitutes three above-ground levels that encourage visitors to learn about science and the natural world. The center includes Exploration Studios, a new temporary exhibition gallery, an atrium space, a completely-redeveloped Discovery Zone for early learners, and the outdoor, Boettcher Plaza with unique public art. The Avenir Collections Center, part of a $70 million expansion in 2007, is a climate-controlled facility devoted to housing for nearly 1.5 million artifacts and specimens. The facility includes 63,000 square feet in two underground levels, and holds specimens such as bison form the 1870s, passenger pigeons, the last grizzly bear to be killed in Colorado in 1979, and roadkill brought in by the public. The data from these specimens is placed in online databases, and linked to public databases, like BioPortal. The museum contains a number of hidden secrets that visitors may search for. Kent Pendleton, one of the museum's diorama painters, painted eight elves in his work, hidden throughout the museum. Guests are encouraged to search for the elves with a printable scavenger hunt In the IMAX lobby entrance there are several painted pictures hidden on the walls relating to Star Wars. ↑ "List of Accredited Museums" (PDF). aam-us.org. American Alliance of Museums. Retrieved 6 April 2013. ↑ "Carter's Life Work". Grit-Advocate. Colorado Historic Newspapers Collection. February 16, 1900. Retrieved August 13, 2016. ↑ "Fairplay Flume, 1892". Fairplay Flume. Colorado Historic Newspapers Collection. June 2, 1892. Retrieved August 13, 2016. ↑ "Dedication of state museum". Routt County Republican. Colorado Historic Newspapers Collection. July 10, 1908. Retrieved August 13, 2016. 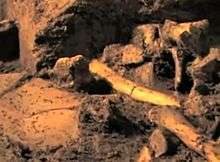 ↑ "New evidence links America and ancients". Schenectady Gazette. August 28, 1936. ↑ "SCFD and the Museum". dmns.org. Denver Museum of Nature and Science. Retrieved 11 August 2010. ↑ Mary Rodriguez (April 19, 2016). "DMNS Egyptian mummies undergo high-tech tests in Colorado". 9news.com. Retrieved August 13, 2016. ↑ "Mummies Undergo CT Scans To Better Understand History « CBS Denver". Denver.cbslocal.com. April 19, 2016. Retrieved August 13, 2016. ↑ Carol W. Maybach (November 19, 2014). "The Amazing Science Behind Your Personal Tastes: Learning Through Beer and Chocolate". 5280.com. Retrieved August 13, 2016. ↑ Bill Rice (April 28, 1996). "Denver museum exhibit explores Earth's history". The Daily Gazette. Retrieved August 13, 2016. ↑ Terri Cook (January 19, 2016). 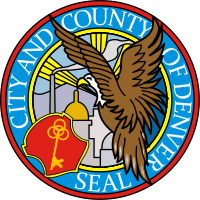 "Denver Museum of Nature and Science Ancient Denvers Explores Geologic History". 5280.com. Retrieved August 13, 2016. ↑ Electa Draper (February 5, 2014). "Denver Museum of Nature & Science enters new wing and era – The Denver Post". Denverpost.com. Retrieved August 13, 2016. ↑ Joshua Pilkington (May 14, 2014). "Maya: Hidden Worlds Revealed". Lavozcolorado.com. Retrieved August 13, 2016. ↑ John Wenzel (October 8, 2014). ""Whales" exhibit at Denver Museum of Nature & Science makes a splash – The Denver Post". Denverpost.com. Retrieved August 13, 2016. ↑ Ed Sealover (January 5, 2015). "Silk Road exhibit represents new direction of Denver Museum of Nature & Science (Slideshow) - Denver Business Journal". Bizjournals.com. Retrieved August 13, 2016. ↑ "'Silk Road' Exhibit Takes Visitors On Ancient Trade Route « CBS Denver". Denver.cbslocal.com. November 23, 2014. Retrieved August 13, 2016. ↑ "Denver Museum of Nature and Science Unveils Initiative to Become Rocky Mountain's Premier Resource". Prnewswire.com. September 21, 2000. Retrieved August 13, 2016. ↑ Ray Mark Rinaldi (February 20, 2014). "Denver Museum of Nature & Science addition gets the science, misses the nature – The Denver Post". Denverpost.com. Retrieved August 13, 2016. ↑ Sam Brasch (June 9, 2016). "What's Beneath The Denver Museum Of Nature & Science? A Million Dead Animals". Cpr.org. Retrieved August 13, 2016. ↑ Kristin Hugo (August 9, 2016). "Everything You Were Afraid to Ask About Roadkill". News.nationalgeographic.com. Retrieved August 13, 2016. Wikimedia Commons has media related to Denver Museum of Nature and Science.